Talk of the possibility of a coalition government has grown in recent days. AMHERST, N.S. 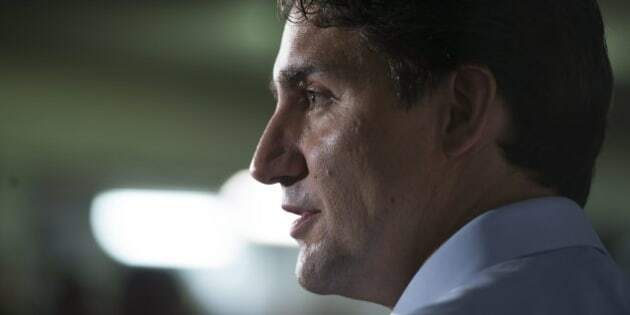 — Federal Liberal Leader Justin Trudeau says Canadians don't want a coalition if a party wins a minority government after the election. Trudeau was in Amherst, N.S., on Tuesday, where he was asked whether he would entertain the idea of forming a coalition government after Oct. 19. "We will always be open to working with others,'' Trudeau said. Conservative Leader Stephen Harper told CBC's the National on Monday he would step down if his party doesn't win the most seats in the election. Bloc Quebecois Leader Gilles Duceppe said Monday he would be open to supporting a coalition with the New Democrats or the Liberals, but not the Conservatives. Trudeau was campaigning alongside Bill Casey, the Liberal candidate for the Nova Scotia riding of Cumberland-Colchester. Casey is a former Conservative MP who was expelled from the party in 2007 when he voted against the federal budget. At the time, Casey said he felt the budget would harm his province's ability to secure revenues from the oil and gas sector. His decision to stand up to Harper earned him cult-like status in the province. In 2008, he won the riding as an Independent, taking almost 70 per cent of the votes.